Kate: I own Clint Eastwood’s ex-girlfriend’s hat. Really. Jol: Jol. It’s short for Jolyon. Kate: Gummi Bears – They. Are. Creepy. 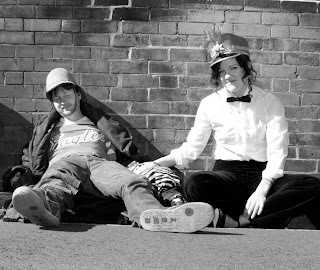 Jol: Toad of Toad Hall – I’d like to drive vintage cars in a jaunty suit. Kate: Mike from Mike I Don’t Like - He has no filter and I’m quite partial to a good rant. Jol: The 1800s. The golden era of exploration. I feel I’d be useful on a leaky boat up the Amazon. Kate: Any time where ladies were encouraged to wear ridiculous dresses and eat cake all day – I know Jimmy Cook wouldn’t approve, but I’d feel right at home. Kate: What? You wrote a book! My work here is done. Jol: What happens to Han Solo? Kate: John Marsden is a big influence. 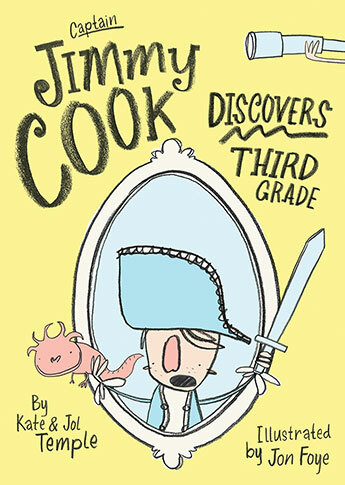 When I was little I read all his books, and then I was lucky enough to have him visit my school and take my class for the day. I don’t remember much about school, but I sure do remember that day. Jol: It’s a toss up between Dr Seuss and Herge. 10.What/who made you start writing? Jol: Arlo my son. When he was a baby we spent a lot of time brainstorming at 3 am. Kate: I always wanted to be a writer. Not sure why, but I can’t seem to shake it off. 11.What is yourfavourite word and why? Kate: Akimbo! What a word. I’m going to say it again. Akimbo. Akimbo. Akimbo. Jol: Sasquatch. My reasons are my own. Kate: Hmm. One book. That’s a bleak future. I’m going to say PD Eastman’s Go Dogs Go. I’ve read it 6 million times and I still like it. Jol: Anything by Richard Scarry. You always see something new every time you read one. Kate and Jol Temple are Australian children's authors living in Sydney, Their books include the picture books Mike I Don't Like, Parrot Carrot and I Got This Hat. 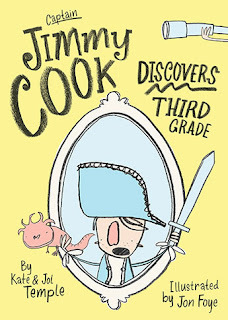 Their latest book is Captain Jimmy Cook Discovers Third Grade, illustrated by Jon Foye and published by Allen & Unwin. Visit Kate and Jol's website and Facebook page for more information about their books and latest updates.